Hands-on Chiropractic for the whole family! Hello and thank you for visiting our website. We would like to take this opportunity to tell you about our office and chiropractic. Dr. Klindt is a third generation Chiropractor and has been practicing in Bardstown for over 20 years. Dr. Klindt graduated from Palmer College of Chiropractic. He serves on the board of the Kentucky Chiropractic Society and is a member of the American Chiropractic Association. The office has been voted Best Chiropractic Office in Bardstown a total of eight times (2002, 2005, 2009, 2010, 2015, 2016, 2017, and 2018). This is more than any other chiropractic office in Bardstown. Chiropractic is a natural form of healthcare that focuses on the nervous system and the joints of the spine and other joints in the body to insure optimum health and performance. If a joint loses its normal range of motion and becomes fixated/misaligned “Chiropractic Subluxation” that joint may degenerate and decay over time. The joint itself can become inflamed and painful and the nerve associated with that joint can be irritated and cause localized pain or radiating pain. A chiropractic specific adjustment improves joint mobility and allows the joint to get the nourishment and nutrients it needs to heal and stay healthy allowing the nervous system to function as intended without compromise. In February of 2011 I came to Dr. Klindt’s office in so much pain I could barely walk. It was a pinched nerve in my back. I made several visits since then, first three days weekly and now once monthly. 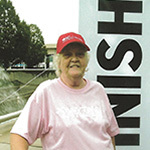 On Saturday, Sept. 17, 2011, I completed the 5K heart walk in Louisville, I am very proud of this accomplishment. I don’t think I could have of done it without the help of Dr. Klindt and his office staff. Thank you all very much.